Things may not be heating up in New York quite yet (we’re looking at you, spring snowfall), but they’re certainly heating up in the kitchen this week at Zweigle’s. Today, we’re cooking up a delicious and cheesy hot dog with a just bit of bite. We’re all about putting a spin on our classic and beloved Pop Opens, and this simple recipe does just that. Check it out for yourself, and don’t forget to let us know what you think if you try this Zweigle’s hot dog recipe at home! Cook bacon according to instructions. Crumble and set aside. Add cheddar and pepper jack cheese to a small pot over medium heat. Add in milk, and stir frequently until melted completely into a sauce. Leave on low heat and stir periodically. Prepare your Zweigle’s hot using your preferred method (we cooked ours stovetop! ), and toast bun if desired. 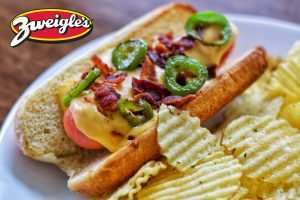 Place Zweigle’s hot into bun, topping generously with cheese sauce, bacon bits, and jalapeño slices.